Well, I’m back. After an eventful 90 days downrange, I’m slowly getting back into the swing of things. To be honest, I wasn’t able to run very much due to the long days and unpredictable schedule. After Bear Paw, I considered trying to train through the deployment so I could come home and get right back after it at the Bonny Sosa Tuesday Night Race Series, which some of you may remember was my intro to the Anchorage racing scene last year. In fact, it felt like a bit of a waste because I felt so strong at the Bear Paw that I really wanted to see what else I could produce through the fall. But 12+ hour days and combat conditions aren’t wholly conducive to producing elite fitness. And to be honest, I haven’t taken a good long break in a quite some time (2010 was my last extended break from training). So I decided it was time to ease back for a few months, focus on work, and get back after it over the winter and get ready for a Chicago 2013. Long breaks can be a very good thing. It gives your body a chance to absorb the training, then de-tune for a while before you once again ask it for great things. But coming back is never easy, regardless of desire. Routines have been broken and fitness is lost. It cracks me up when I talk to the un-initiated, who seem to think that just because you ran X for Y distance sometime this year, or maybe even last; you should be able to just lace up and throw down a similar time. But the stark reality is this: your body will answer its demands. Give it inputs that demand fitness, and it will answer. Take away those inputs, and it will answer as well by losing fitness. So, it makes complete sense that after three+ months of running little more than 5 miles a day, often 2.5 at a stretch, I would be out of shape. Which is exactly where I am today. Enter Bonnie, our newly-adopted daughter. We first spotted Bonnie on PetFinder this spring. 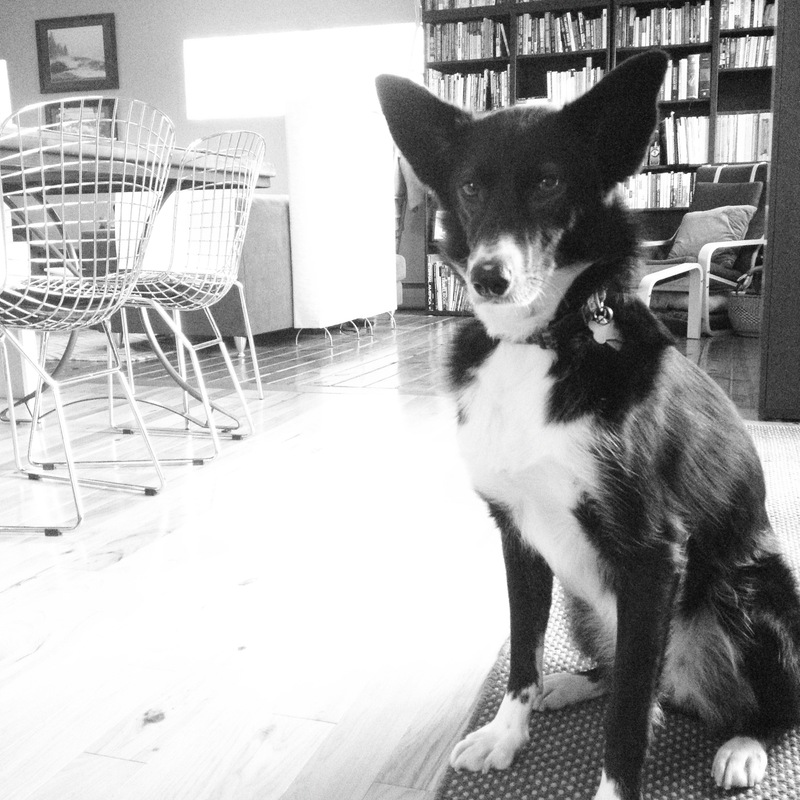 A Border Collie/Shepherd mix and bred as an Alaskan Sled Dog (basically mutts bred small with strong pull instinct), she was rescued in Fairbanks as a feral dog by Momma Carol with Arctic German Shepherd Rescue. Carol painstakingly socialized her for a couple of years, then put her up for adoption, which is how we found her. Carol vetted Jen and I over a couple months, then approved our adoption a few weeks ago when we drove up to Fairbanks. When we first saw Bonnie, we knew that she was the dog for us, and meeting her proved the hunch correct. Don’t get me wrong – I love Rider. But Bubba isn’t much for running more than a couple of miles unless he’s roaming free in the backcountry. I’ve always wanted a dog to run with, and Bonnaroo is just the lass for that. Case in point: upon arrival in Anchorage, Bonnaroo escaped from the garage as we were unloading into the night. Old girl took me on a half mile chase that would have ended up right back in Fairbanks had I not cornered her in some woods. After some serious coaxing, and a little nervous poo (her, not me), the story ended happily with me emerging from the woods with Bonnie in my arms, an anxious Jen awaiting with a leash. Over the past few weeks, we’ve gotten into running shape together. So far, our longest run has been about 12 miles of combined path and trail. There have been some slight hiccups, since she’s still learning leashed travel. But even 12 miles seemed to leave her unfazed. And her unbridled enthusiasm often leave me smiling and laughing over my own personal fatigue. She does this little gallop-thing: all leg and torso, mouth agape and tongue out as she bounds alongside me. It leaves me in stitches and reminds me of the joy of fulfilling one’s recognized purpose in life. I’m not sure how long she can or should run, but The Plan is to take her on my runs in and out of work at the very least. I know a well-conditioned dog on a sled team can run practically forever. But those dogs have years of training under their collars. I guess we’ll find out together. I have to think that eventually she could handle a 90-100 mile/week training load as well as I could, but I’ll have to do some more research and talk to some of the local mushers. In the meantime, I’m happy for the slight tug on my waist that represents my new training partner. Bonnaroo is hardly labored at the end of our little jogs; I actually get the feeling on each and every run that I’m holding her back as opposed to pushing her limits. It’s a bit humbling to say the least, as well as refreshing. After training solo, for so long, it’s nice to have a partner in crime who always seems ready to get out the door. I love watching the pure pleasure on our pup’s face when she is on a run. It brings me down to earth and reminds me how much FUN running is! 🙂 Congratulations on the newest member of the family! !